Among various herbal aids used in acne treatment, burdock root is a recommended option. Burdock is a member of the Asteraceae plant family. Burdock is essentially a herb that can be grown in household gardens. Burdock is also used as a culinary ingredient for flavoring foods. While the leaves and stems are used for flavoring dishes, the root is used for internal and external cleansing purposes. Burdock root has a slightly pungent flavor and a grimy texture. It cannot be consumed in its natural form. It has to be crushed and boiled for either topical application or for direct consumption. The brown-colored root is used in many herbal medication combinations for treating various kinds of skin disorders and for healing surface wounds. Burdock root can cure acne because it has an antiseptic action of the skin. It helps to arrest the growth of acne-causing bacteria. Further, it helps to neutralize the toxins that are embedded upon the skin. Burdock root contains polyacetylene that is known to impede the growth of fungi and bacteria. This includes dead skin cells impacted with dried keratin and live bacteria that gives acne its typical, inflamed appearance. As an anti-inflammatory agent, burdock root is excellent for reducing the redness caused by acne. In fact, it is recommended for treating skin conditions like rosacea and eczema that are associated with extreme inflammation of skin. Many herbalists recommend consuming burdock root tea for cleansing the body. This is recommended when internal toxicity is regarded as the main cause of acne. This happens due to the accumulation of toxins from chronic constipation or unwise dietary habits. The impurities in blood alter the pH levels of the blood besides impairing its natural immunity against acne. 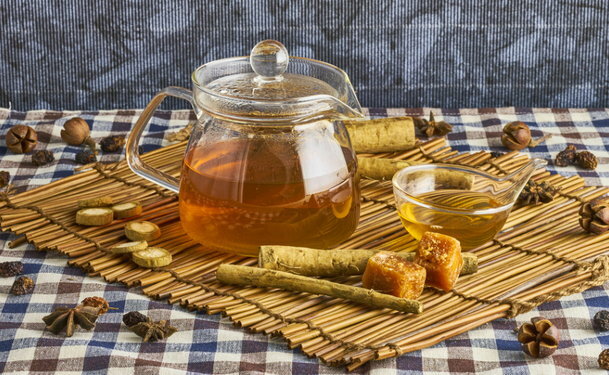 Here, burdock root tea is a helpful aid to cleanse the body. This tea acts like a diuretic, helping in the removal of toxins via urination. The increased urination is assisted by the natural antiseptic properties of burdock root mentioned above. Burdock root should be used in two ways for enhancing its overall effect. This means consuming the burdock root extracts in the form of tea-like concoction and applying it like a topical ointment. Getting Started—the root has to be crushed. You can do this by crushing the root in a mortar and pestle. If some parts of the root seem too hard to crush, you can grate them. Preparing Burdock Root Tea—pour some water in a saucepan and place it over the stove. When the water stars boiling, add the crushed burdock root. Turn-off the flame and allow the heated water to act upon the crushed root, slowly leaching-out its active ingredients. Allow this concoction to cool down to a lukewarm state. Sip some of this immediately and keep the rest for consuming about three times in a day. Remember to heat the mixture minimally before every dosage. Drink just about half-a-cup of this concoction at a time. For flavoring the tea, some ginger and a tablespoon of honey can be added to the heated mixture. Preparing Burdock Root Anti-Acne Mask—use the crushed burdock root extracts and add some oatmeal to it. Mix these two ingredients and add a tablespoon of lemon juice to it. Ensure that you grind these ingredients into a thick paste. Use this paste for direct application over the acne sites. In fact, you can apply it all over the face for preventing the outbreak of acne.